Scientists at the U.S. Fish and Wildlife Service are tracking birds and bats with radar, so they can tell wind farm developers which areas to avoid. Wind energy is on the rise: The U.S. Department of Energy has called for an increase in wind power – with a goal of generating one fifth of our electricity in just fourteen years. 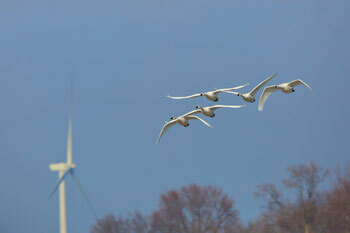 But with an increase in the number of wind turbines comes a threat to birds and bats. At more than 100 feet long, turbine blades present a possibly fatal danger to these animals, while the construction of large wind farms could potentially destroy habitats. This is of particular concern in the Great Lakes, since the region is so important to migrating species. So biologists like Nathan Rathbun of the U.S. Fish and Wildlife Service are using radar, acoustic monitoring and visual surveys to better understand the migration patterns of birds and bats along the coasts of the Great Lakes. Learning which areas are most heavily used will allow biologists to advise wind power developers which areas to avoid, so that wind farms pose less of a threat to wildlife.